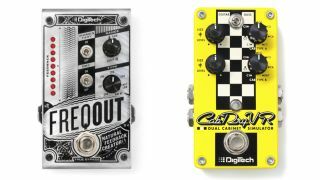 NAMM 2017: Effects firm DigiTech has lifted the lid on two brand new pedals, the CabDryVR dual cabinet simulator and FreqOut natural feedback creator. First up, the FreqOut, which already looks like a 'best in show' award contender, offers guitarists the opportunity to generate "natural" sounding feedback without an amp, distortion or sizeable volume. What's the point of feedback without trouser-flapping volume, you ask? Well, besides the obvious rehearsal and home recording applications, the FreqOut's 'Range' and 'Type' controls can be used to focus particular harmonics. Secondly, the CabDryVR includes 14 guitar and bass cab emulations and includes dual inputs and outputs, one of which can be engaged as a dry path. Of particular interest is the Cabinet Tuning control, which allows the user to manipulate the size and tone of the emulated cabinet. Read the full press releases for both pedals below. The CabDryVR features dual inputs and outputs, one of which has an optional dry path that can run to your on stage amp. The CabDryVR Cabinet Tuning™ Size control was developed for the venerated GNX Series and morphs the resonant peak of the cabinet to create custom cab sizes and tones. Individual output level controls let you balance each cabinet's volume in the mix.